Back in late May and early June our peach tree gave us plenty of fruit. Although small in size they were pretty good. I prepared some for the freezer, hoping to use them at a later date, which I finally was able to do. First I made a smoothie for our grandson and hubby, who were hard at work in our yard last week. I figured they would enjoy a cold drink early in the morning. If you recall my smoothie recipe from my post https://laflor5233.wordpress.com/2015/06/16/ I added strawberries, but this time I added some frozen peaches and it turned out very refreshing. 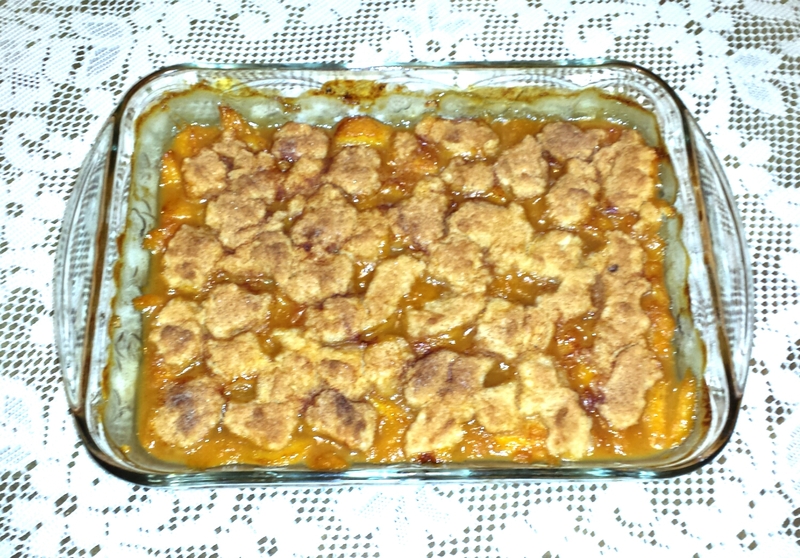 I also found a peach cobbler recipe on allrecipes.com, which I plan on using from now on. 8 fresh peaches, peeled, pitted and sliced.–I used about 6 or 7 cups of my peaches. 1/8 tsp nutmeg—I didn’t have any, so left it out. 6 tablespoons unsalted butter, chilled and cut into pieces. 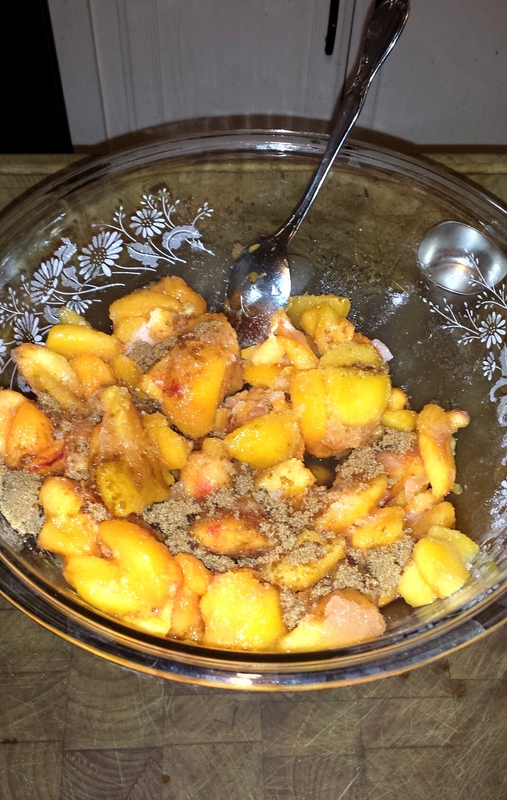 In a large bowl, combine peaches, 1/4 cup white sugar, 1/4 cup brown sugar, 1/4 tsp cinnamon, nutmeg, lemon juice. and cornstarch. Toss to coat evenly, and pour into a 2 quart baking dish. Bake in preheated oven for 10 minutes. Meanwhile in a large bowl, combine flour, 1/4 cup white sugar, 1/4 cup brown sugar, baking powder and salt. 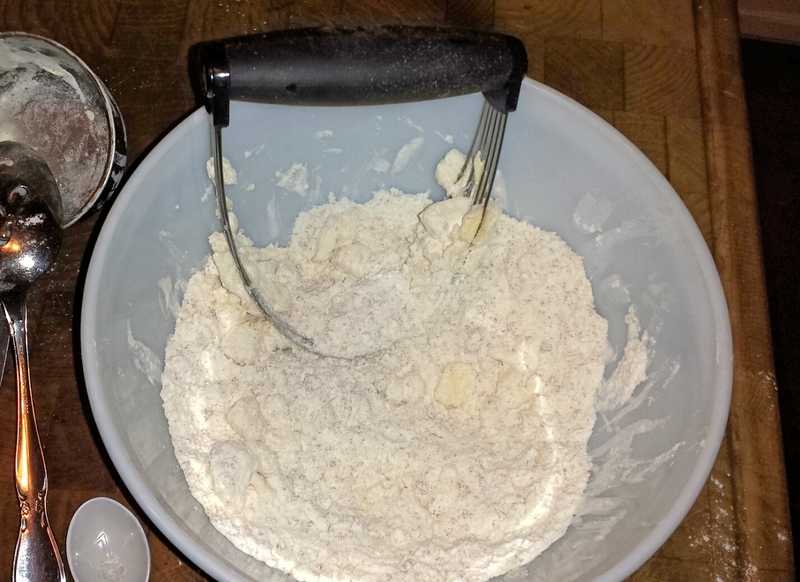 Blend in butter with finger tips or pastry blender, until mixture resembles course meal. Stir in water until just combined. Remove peaches from oven, and drop spoonfuls of topping over them. Sprinkle entire cobbler with the sugar and cinnamon mixture.